It’s Friday 13th today, and as we all know it is considered by most as an unlucky day, in order to keep lady luck on their side, Brits will be practicing a whole host of bizarre superstitions on this Friday 13th. Ranging from the ancient tradition of carrying a rabbit’s foot to the more modern practice of avoiding the cracks in the pavements, the UK remains a deeply superstitious nation. 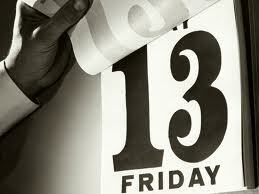 Research has found that 8% of Britons believe that Friday 13th is unlucky, meaning that they suffer from a phobia known as Friggatriskaidekaphobia. But on the flip side, those of you, that were born on the 13th of a month, especially born on a Friday 13th of the month, then this day is considered one of the luckiest for you, so today would be a good day to go and buy a lottery ticket, or such like. Either way we should all keep smiling, not be too scared, and make the day what we want it to be. Celebrities have been tweeting their Friday 13th thoughts today too. @billbailey Thanks for good wishes, and superb thoughts to all those who share a Friday 13th Birthing Zone. Drink responsibly.